Just wow. This leg of the trip surprised and amazed us. Our venture to southern Idaho opened up amazing worlds to us — of wildflowers blooming in lava fields, of hiking to the top of a volcano, to climbing over rocks once covered but revealed through erosion, of witnessing the fossilized remains of an ancient horse, of emigrant trails through harsh lands that made us pause to think — but mostly of the power and breadth of volcanoes and eruptive fissure systems — and how much of Idaho, Oregon, and Washington have been shaped by ancient volcanoes, glaciers, and giant floods! 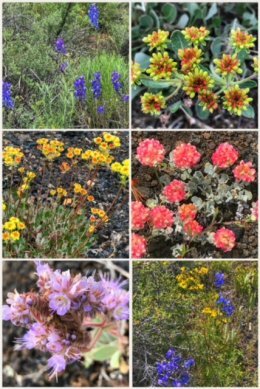 We started at Craters of the Moon National Monument and Preserve, and while we would love to admit we planned it this way, we did not… but we arrived at the perfect time to witness a plethora of blooming wildflowers, including Monkeyflower, Buckwheat, Bitterroot, Gland Cinquefoil, Indian Paintbrush, and more. 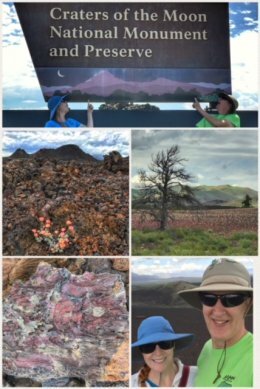 In fact, it was amazing to discover that this land that is entirely covered in all sorts of lava supports more than 700 different types of plants. The peak for these blooms is mid-June — before temperatures hit the triple digits later in the summer. The surface of the Craters of the Moon — its vast lava fields — was caused not from one volcano, but from a series of deep fissures that cross the Snake River Plain… known collectively as the Great Rift. 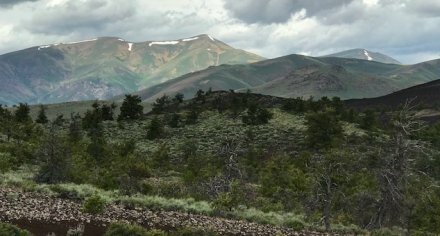 The most recent eruption was only 2,000 years ago — and scientists believe that future volcanic activity is very likely. The park contains more than 60 lava flows, 25 cinder cones, and 8 eruptive fissure systems. 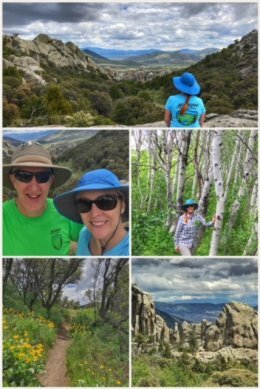 In just one day we were able to climb up to the top of the Inferno Cone, peer into the Spatter Cones (one with snow still at the bottom), stroll the Devils Orchard Nature Trail, and hike the Tree Mold Trail. 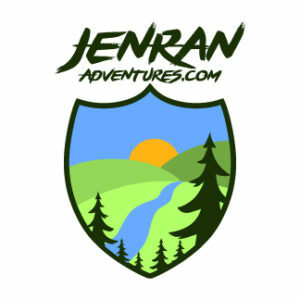 It was an amazing day of adventure! 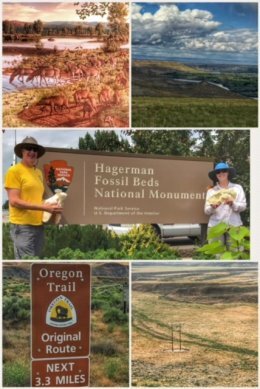 Next up was a visit to the Hagerman Fossil Beds National Monument and a hike along the Oregon Trail. While we enjoyed a fun visit to the park’s visitor center, we discovered because of an extremely wet spring, that the main trail in the park was closed due to flooding. Have you ever heard of the Hagerman Horse? Also called the Hagerman zebra, this horse (from the genus Equus) was a North American species from the Pliocene and Pleistocene epochs ( a time of sabertooth tigers, massive ground sloths, and mastodons), first discovered in Hagerman, Idaho — and later discovered in other areas. It is the state fossil of Idaho. The find in Hagerman is especially interesting because many bones were found near a watering hole thought to have flooded in one of the ancient floods, killing the zebra-like herd of horses. Various floods, including from ancient Lake Idaho and Lake Bonneville carved high bluffs along the Snake River, exposing layers of sediment and fossils. The great Bonneville Flood also deposited fields of melon gravel — lava boulders — across the area. Even more fascinating is that the Oregon Trail went right through this same area, and because of the composition of the soil, we can still see ruts from the old wagon trains! Between 1840 and 1869 more than 500,000 pioneers sought greater fortunes in the west, leaving their homes and taking whatever possessions fit in their wagons and embarked on the 2,000-mile route across multiple states, from Missouri to Oregon. The part of the trail that went through southern Idaho was hot, dry, and dusty, and many folks used a spot near the Snake River as a key rest area. 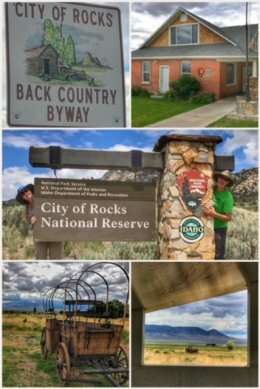 We started our visit here, as we do in many of the parks and monuments, with a stop at the visitors center, located in a cute little building, which is jointly operated between the National Park Service and Idaho State Parks (which manages the adjacent Castle Rocks State Park). As is also typical with us, we watched an informative movie about the formation and history of City of Rocks. These granite spears and other formations that appear throughout the park are part of a fascinating geological and climatic story, in part due to the park’s location in the geologic province known as the Basin and Range. Some of the granite is millions of years old, while other granite is billions of years old. Crazy stuff. 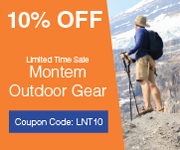 The park is known for hiking, climbing, and camping. 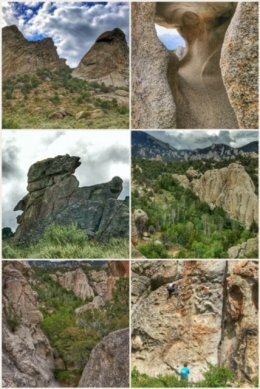 While we were out and about we watched numerous rock climbers scaling various rock formations in the park. Part of the “eventful” part of our visit to City of Rocks is that on our first stop within the park Ran slid on loose gravel on the side of the road, slamming his back onto the foot-railing of the truck, causing sharp pain and a massive bruise (but luckily missing ribs and kidney). After taking ibuprofen, Ran was determined to hike and see the park — which is just what we did. 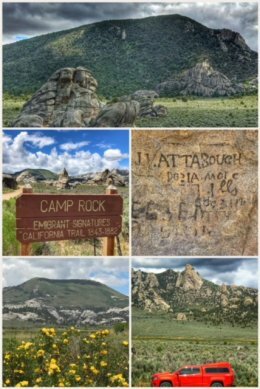 We ended up hiking quite a few miles that day — mostly on some shorter trails, including: Window Arch Trail, Bath Rock Trail, and Flaming Rock Trail (loop). But our favorite hike was from the North Fork Circle Creek Trailhead, which traveled through Aspen groves, Singleleaf Pinyon Pine forests, and fields of wildflowers, leading to a scenic spot to rest — which you can see at the top of the picture to the right, with Jenny looking out into the vastness of the park. The park has more than 22 miles of developed trails, and one can also go deeper into the backcountry. 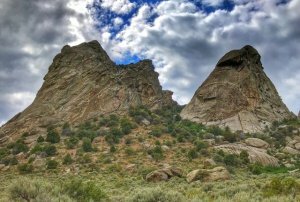 If you are not up to climbing or hiking, consider driving the 49-mile City of Rocks Back Country Byway, a peaceful and scenic route. We ended our day at City of Rocks with a stop to the Twin Sisters, located in the most southern part of the park. While called sisters, these granite spires are more like mother and great-great-great-grandchild… because the one on the left is about 2.5 billion years old, while the one on the right is only about 25 million years old — yet both brought to the surface together through erosion and uplift. We left the area with our spirits uplifted, our bodies healing, and excited about the next adventure!